CJCA • Cracker Jack Toys? Here is a group photo of all my lovelies. First glance, are these Cracker Jack Toys? Maybe old bubblegum toys? I'll let the experts answer this question, as this is outside my limited knowledge. I re-sized the image for those with slow computers or small screens. The original image can be seen here -> Big Image. AGE: Although they are similar in style, mostly charms, there is a great range of items here, from the late 1930s through the 1960s. USE: These are not Cracker Jack prizes. C.J.Co. (and later Borden) had higher quality standards for prizes. 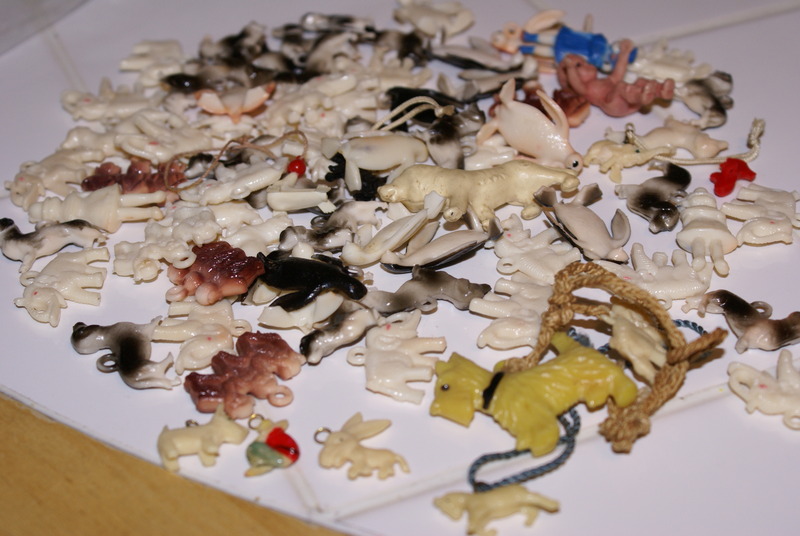 Most of these are gum machine charms, although a few were novelties marketed in other ways. Celluloid is the plastic material used to make the smaller charms with metal rings. The large lion in the center is made of celluloid (late 1930s or early 40s). Since injection-molding was put into popular use in 1948 and made celluloid obsolete, about the only thing that celluloid is used for nowadays is to make ping-pong balls. Injection molding was used to make the prizes with larger rings molded on top from either polypropolene (used these days to make pop bottle caps) or high density polyethylene from 1948 through the 1960s. THE WINNER: Although there are no CJ prizes here, my favorite of this group of trinkets (and probably the most desirable item for collectors) is the scotty dog near the bottom, right of center. This appears to be made of Bakelite (or similar phenolic), the first synthetic "plastic" which is still used to make billiard balls. Due to it's theme and material this dangle was most likely produced between 1940 and 1945.